Accurate, reliable liquid flow measurement is essential to the cost-effective operation of municipal water and wastewater treatment systems. From water storage to transmission lines to raw water and wastewater treatment, there is a McCrometer solution. Colleges and universities are working harder than ever to account for their resources, but getting a handle on steam production can be tricky. A growing number of schools are banking on one solution for better insight. Failure to capture meter readings at the low end of the production scale is a missed opportunity for steam system operators. Here’s why that is happening and what you can do to attack the problem. Designed for ease of irrigation flow measurement, the new Dura Mag flow meter from McCrometer provides precise, reliable flow data for water management. Municipal and Industrial water and wastewater treatment systems present a challenging environment in which the accurate and reliable measurement of liquid flow is essential for cost-effective plant operation. 3 Tips To Optimize Cooling Water Management For Lower Plant Operating Costs The proper control and treatment of cooling water is essential for efficient, safe, and economical operations. Chemicals are fed to these systems that protect against fouling, corrosion, and microbiological contamination. The proper dosage of these key chemicals is determined by having accurate information on the system make-up and blowdown water. 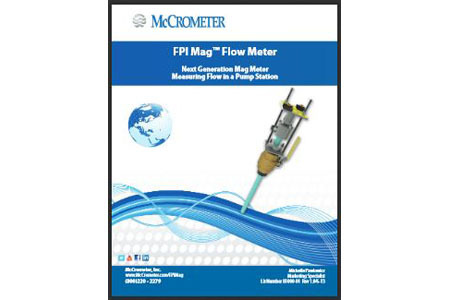 If your flow meter is costing you time and money ... and that all adds up to real operational headaches, then you might want to hear what four McCrometer customers who installed the FPI Mag Flow Meter have to say about this problem-solving flow instrument. McCrometer is a global leader in providing flow measurement solutions including differential pressure (DP), electromagnetic, and propeller technologies. McCrometer’s flow measurement solutions are found in thousands of installations worldwide including Municipal/Industrial Water & Waste, Agriculture and Turf Irrigation, Institutional Facilities applications and many more. Its products and systems meet many of the world’s most demanding safety and quality standards. McCrometer offers the industry’s preferred liquid flow measurement solution for both clean and waste water applications. The VM V-Cone® System is a perfect fit for water and wastewater treatment applications, with built-in flow conditioning for high accuracy and a rugged no moving parts technology that operates over a wide turndown range. Flow measurement plays a vital role in agriculture and turf irrigation. McCrometer's 50 years of industry experience resulted in the best-selling irrigation flow meter in the US, the Mc® Propeller meter. Mc Propeller meters play a vital role by helping farmers conserve water resources and optimize irrigation for improved crop yields and soil conservation. Institutional facilities users require flow meter solutions that maintain accuracy in steam and chilled water applications to meet today’s increasingly tight government regulations. McCrometer’s V-Cone® advanced differential pressure flow meter is exceptionally precise in both steam and chilled water systems. The Ultra Mag® Flow Meter is a precision electromagnetic instrument designed specifically to meet the liquid flow needs of the municipal water and wastewater industry. With innovative features, such as a state-of-the-art microprocessor-based signal converter, it delivers exceptional reliability, durability and ±0.5% accuracy. The flow meter’s unique NSF-approved UltraLiner™ provides superior electrical insulation as well as excellent protection against corrosion and abrasion. The Water Specialties Propeller Meters™ are designed and manufactured with precise techniques and high quality components. They offer superior performance, low maintenance and unsurpassed durability. Meter materials and flow ranges for low velocity construction meet or exceed AWWA standard C704/92. The patented V-Cone® Flow Meter solves challenging fluid applications, and operates in some of the harshest environments. This advanced differential pressure-type (DP) flow meter offers high accuracy and repeatability, flexible installation, and little to no maintenance for the widest range of fluids. The FPI Mag™ (Full Profile Insertion) Electromagnetic Flow Meter is the only hot tap full profile insertion flow meter available on the market. The FPI Mag installs without service interruption making it ideal for retrofits, upgrades and maintenance projects and sites never before metered. The hot tap installation significantly reduces installation time eliminating the need to de-water lines or cut pipe. Unlike traditional propeller meters, the Mc Propeller uses a flexible drive-train and sealed ball bearings. Its unique design makes it easy to service in the field and requires no external power or batteries. The Mc Propeller is designed to comply with AWWA standard No. C704/08. Standard features include an instantaneous flow rate indicator and six-digit totalizer. The FS100 Flow Straightener provides breakthrough flow straightening technology that virtually eliminates the upstream / downstream straight pipe runs typically required in existing or new flow meter applications. Requiring only 1.5 straight pipe diameters upstream and 0-0.5 downstream, the FS100 Flow Straightener when installed with the McPropeller slashes typical installation piping and labor costs by more than 50 percent, which makes it the right fit in both retrofit and brand new installations.